Start gathering your best work: The 2018 California Journalism Awards are underway. Entry packages for Print and Campus divisions — and the new Digital Division — were mailed to CNPA members last week. The Digital Division, with 22 categories, is open to CNPA Digital News Media members and print members. Entries by newspapers must be substantially different from what appeared in print, either in content or in the way the content is presented. (For example, a print article that is presented online with additional materials, such as a video or other graphics not included in the newspaper.) Newspaper entrants will be asked to state how their digital entry is different from what appeared in print. Entries in the Open Division categories will be the first-place winners in those categories from the Print and Digital competitions. Separate entries in the Open Division are not permitted. The contest website betterbnc.com will be open for entries later this week. Deadline for entries is Monday, Jan. 28, 2019. 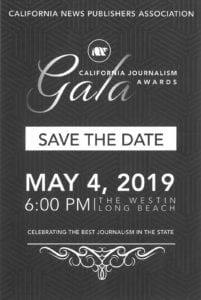 CNPA will present the awards at the first-ever California Journalism Awards Gala on Saturday, May 4, 2019, at The Westin Long Beach. Questions about the contest? Contact contest administrator Simon Birch, 916-288-6010).